Last year, Lee Jae-yong, the de facto leader of Samsung, was found guilty of bribery and embezzlement. Lee was sentenced to five years in prison, hinting at a future in which powerful South Korean leaders are unable to evade culpability for white-collar crimes. 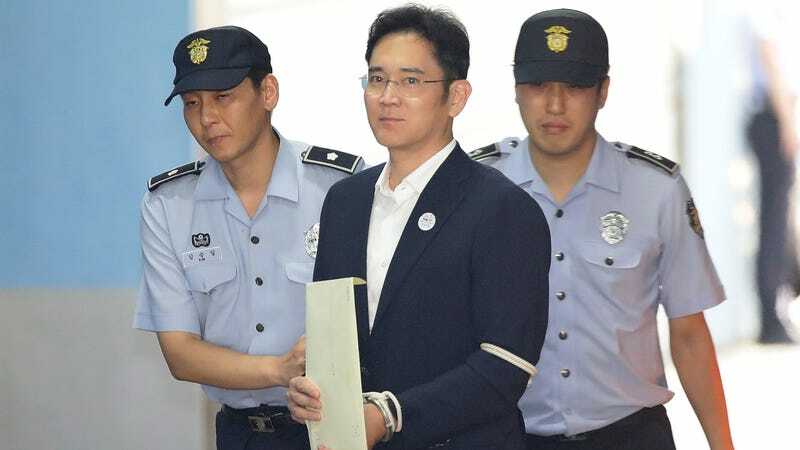 But on Monday, the Samsung heir was freed from prison after an appeals court reduced and suspended his sentence. Lee had pleaded not guilty to all charges and spent nearly a year in jail, CNN reported, before the appeals court reduced his sentence to two and a half years and suspended it for four. The court reportedly found him guilty of one bribery charge, but not of hiding money offshore. It also overturned another bribery charge. The bribery case allegedly involved millions of dollars in payments and gifts to motivate then-South Korean President Park Guen-hye and her mentor Choi Soon-sil to influence the National Pension Service to approve a Samsung merger. According to prosecutors, one of the bribes included a $900,000 horse for Soon-sil’s daughter, The New York Times reported. The merger, which was ultimately approved, helped maintain succession in the family, and ensure Lee’s power. Forbes estimates his current net worth to be $8.1 billion. It’s important to understand that Samsung has a tight grip on the country’s economy. Known as a “chaebol,” or a (usually family-owned) business conglomerate, Samsung contributes to a little over one-fifth of the country’s exports. Its businesses make up about 15 percent of the country’s total economy. It is extremely rare for leaders of the country’s chaebols to be justly punished for their crimes—most convicted are ultimately pardoned or granted a commutation. Lee’s father, Lee Kun-hee, has been pardoned twice for similar charges. Samsung Raided Over Presidential Cult Scandal Because Hey, Why Not?